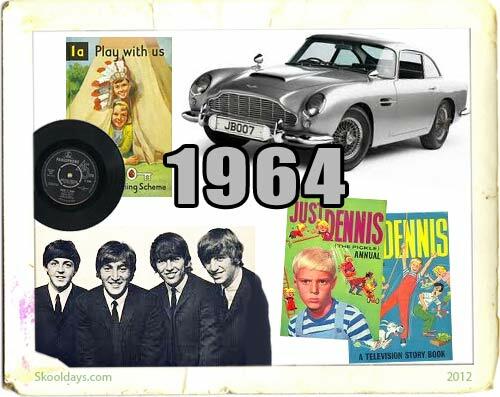 1964 was a leap year that saw Martin Luther King, Jr receives the Nobel Peace Prize, James Bond released his third outing with Goldfinger along with all the merchandise and comedian Harry Hill was born in 1964. This was the year of where the president signed the Civil Rights act of 1964. In the UK the death sentence was abolished. Meanwhile Nelson Mandela is sentenced to life in prison. Boxer Cassius Clay who later changes his name to Muhammad Ali, becomes World Heavyweight Champion. With Goldfinger movie this year came the merchandise and gadgets for every toy box, The popular choice was the Corgi 261. It was the James Bond Aston Martin DB5. If you try and find one today then look to pay around £60 that’s about $100. The Gold ones go for more than the silver version. Dennis the Menace or actually Dennis the Pickle started off as a daily syndicated newspaper comic strip originally created, written and illustrated by Hank Ketcham. This comic strip made it onto kids bookshelfs with TV annuals for the next few years. It was also the year when you learnt how many things in the home were metal. Let me explain by saying it was the year Wham-O’s 1964 monster piece was released. Known as the Monster Magnet, which fused the power of the monster with the power of magnetic energy. This was the year Nicolas Cage and Bridget Fonda were born. If you went to the flicks in this leap year you would of been getting your pop corn before seeing Mary Poppins, or Clint Eastwood in A Fistful of Dollars. Dr. Strangelove or: How I Learned to Stop Worrying and Love the Bomb was another big movie starring Peter Sellers. This Comedy was about an insane general, who starts a process to nuclear holocaust that a war room of politicians and generals frantically try to stop. The Beatles took the world and America by storm and Beatlemania went into overdrive as they released a series of number one hits including “I want to hold your hand” , “All my Loving” . This entry was posted in Arcade, Cartoon, Fashion, LunchBox, Movies, Pop Culture, PopMusic, PrimeTime, Saturday, Toys by Skooldays. Bookmark the permalink. 1964 was my favorite year. It was the year the Beatles came to town and I was almost 14 years old and soooo in love with them! When they appeared on Ed Sullivan’s show I remember being with my family and some aunts and uncles and when they were introduced I turned all shades of red and they all were chuckling because of my reaction to seeing them for the first time on live television. I lived that year listening to Murray the K on WINS in New York City and accumulating albums and posters….. Along with Mary Poppins, another lavish musical film My Fair Lady opened. Julie Andrews had played in the Broadway stage version of Fair Lady but was turned down for the same part in the movie. Her opposite, Rex Harrison, played both stage and film. Rex would receive an Oscar for best actor, and met Julie once again as she was awarded the best actress Oscar!